I undertook to light the fire, no easy task at this altitude, where it requires almost superhuman efforts to induce the wood to ignite. Vines went with a biscuit-tin to collect suitable snow and ice for water ten yards away on the other side of the tent, and crouching down by the fire, I gave myself up to the exhausting work of persist­ently blowing the smoldering wood, thereby filling my lungs, which were craving oxygen, with smoke. I looked up to see what had become of Vines. He stood a few yards from me, apparently doing nothing in par­ticular. The tent being perched on a nar­row ledge, under the shelter of a rock, he had to cross the numerous guy-ropes in order to reach the snow. I watched him slowly raise one leg over the first rope, and stop breathless and ex­hausted. He then wearily dragged the other leg after the first. Thus he pro­ceeded until he reached the snow. It was about ten minutes before he returned, with hardly enough ice and snow in the tin to wet the bottom of the kettle. I noticed during the time I spent at this high camp that the ropes of the tent always needed readjust­ment. The reason was not far to seek, for we were continu­ally kicking them as we passed, no one having the energy to raise his feet high enough to clear them. Under these circumstances, it is not to be wondered at that we did not get our breakfast until long after ten. It seemed to restore Vines at once to comparative activity, but had a contrary effect upon me, for I was attacked by indigestion, and retired to my sleeping-bag for the rest of the morning. I intended to rest the first day, and if possible make the ascent on the next. It began to snow at ten o'clock. It snowed all day. A porter came up during the morning with some wood and provisions, and descended late in the afternoon. In spite of the snow, Vines and I intended to hold on as long as possible. When the day was too far advanced to make a descent possible, about five o'clock in the 'afternoon, the snow in­creased in volume, and the wind rose, caus­ing it to drift. Huddled in our little tent, we anxiously watched the turn of events. We closed the fastenings of the tent, and tried to sleep. But it was not a night for rest. I soon began to realize that we were being buried in the snow, for the corner under the shelter of the rocks where the tent was pitched was filling up with one great snowdrift. At nine o'clock we seri­ously discussed the state of affairs. We must either keep the snow clear of the tent or retreat to the valley. The latter course we feared would be impossible. On such a night we could never find our way down the great exposed slopes of Aconcagua. Vines burrowed his way out of the tent, and with difficulty found and brought in the boots and ice-axes, so that we might be ready for the worst. From time to time we beat upon the roof of the tent, in order to pre­vent a mass of snow from collecting and crushing it in. Sleep was out of the ques­tion. It was a mis­erable and exciting night, and by morning we were quite worn out. Snow began to fall again at nine o'clock, so we made a bolt for the valley. It was useless to at­tempt further climbing in such weather. Our next start from Inca was, therefore, delayed to February 7th. 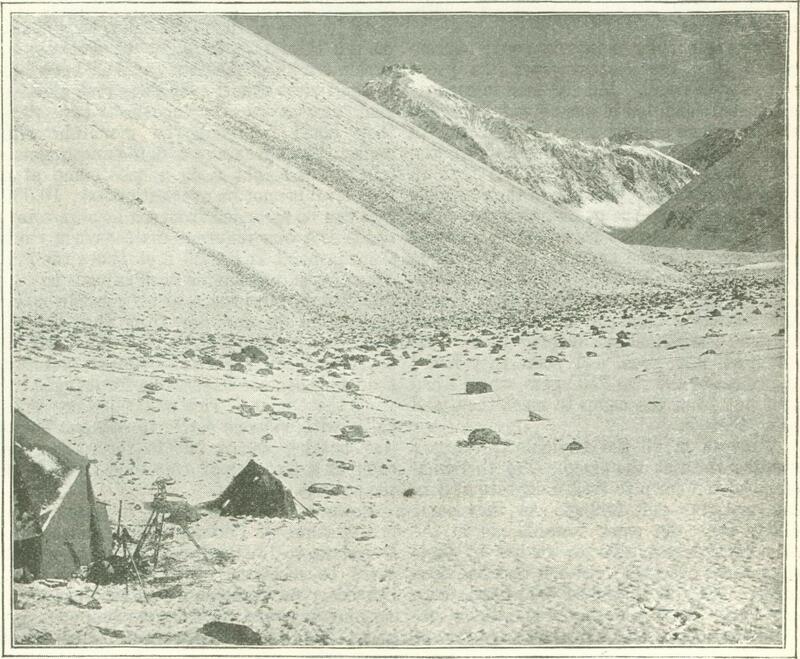 We reached the 14,000 feet bivouac, at the head of the Horcones Valley, and sent porters up to report on the condition of the mountain and the high camp. They came down on the following day with a story that was not encouraging. Owing to continued snow­fall, the difficulties to be encountered in the ascent of the mountain would be greatly increased, and sleeping at the high-level camp was becoming more uncomfortable every day. I started with Vines on the 10th, and on reaching the camp, soon realized that the description given by the porters was only too true. Tent, wood, provis­ions, and instruments were covered with ice and snow. The few cooking utensils were covered with frozen grease. To thaw these things out and clean them up was no easy task, and the difficulties of preparing hot food, so necessary to us, were greatly increased. However, on the 12th the weather looked promising, and we determined to prepare for the as­cent on the following day, for we were not gaining strength by remaining at this altitude. Lanti came up in the evening, for as he had proved himself less suscepti­ble to the surround­ing conditions than the other porters, I wished him to make the ascent with us. He undertook to wake us at an early hour, that we might all have a good breakfast before starting. Unfortu­nately, we were un­able to sleep at night, and as usual made up for it in the morning, so that it was only when the sun came on the tent at 7.30 that Lanti roused us. So slow were our movements, that we did not make a start until after 8.30. Our packs were equally divided, and contained a bottle filled with a mixture of port wine and egg, a bottle of red wine, a flask of brandy, and some Kola biscuits, besides the various instruments, and some extra clothing in the shape of gloves, helmets, and sweaters - about seventeen pounds to each man. I may here mention that the port and egg was almost the only nourishment taken during the day. The aspect of the mountain had changed considerably since Zurbriggen's ascent. He had reached the summit almost without putting his foot on snow; now great fields of deep snow spread over the northwestern slopes as far as the eye could see. We trudged over it for an hour, when, at the height of 20,000 feet, I was forced to turn back. I begged Vines to go on and make the ascent if possi­ble, taking Lanti with him. He fol­lowed practically the same route that had been taken on the previous attempt, clinging to the pro­tection afforded by the base of the cliffs running down from the summit to the north. It was absolutely necessary to keep on the solid rock or hard snow, and avoid as much as possible the soft broken surface caused by the thousands of years of denudation. In ascending by the line of cliffs, they reached at mid-day a spot 21,500 feet high, where, on our first attempt, we had left some provisions and instruments. Here their further passage towards the summit was barred by a precipice, so that they were forced to cross the face of the mountain to the west, in order to reach the couloir ascended by Zurbrig­gen. In doing this they had to pass over the rotten debris which covered the whole of this side of the mountain. Their pa­tience and endurance were sorely tried, for they were at an altitude of 22,000 feet, and the fatigue caused by slipping and falling on the unreliable surface was very great. At each step the whole side of the mountain seemed to give way, and they were con­tinually thrown down on their hands and knees. It took them over an hour to cross the slope to the couloir; not that the dis­tance was very great, but they were forced to halt every few minutes. Their legs seemed incapable of working for more than twenty steps at a time, and the difficulty of breathing seemed to increase at each step. At 2 P.M. the couloir was reached, and after an ascent of some 300 feet, they entered a vast amphitheater filled with masses of broken red rock. The opposite wall of this was formed by a great arete, which joined the eastern and western peaks of Aconcagua, and ran from one end of the mountain to the other. To the left of them rose a huge bastion of rock on which was the actual summit. To the right, cone-shaped locks and aiguilles towered into the clouds above. Not a vestige of snow was to be seen within this vast enclosure. They were nearly 22,500 feet above the level of the sea, and in no mood to cope with the fre­quent petty annoyances which occurred while scrambling over the great rough stones and boulders now blocking the way. An almost irresistible desire to turn and descend, and the longing for some stimulating nourish­ment, seemed to overwhelm them. In halting they found there was only one position for rest and recuperation. The overpowering lassitude that seized their lower limbs after sitting or reclining made this mode of rest out of the question, and instinct soon taught them to stand with legs wide apart, the body thrown far forward, the hands grasping the head of the ice-axe and the forehead resting low on the hands. Ten or a dozen violent respirations brought the breathing back to its normal state, the legs gradually regained power, and they were able to advance a short distance. So they proceeded until, at 4.30, the great arete that joined the eastern and western peaks was reached. Vines crept to its edge, and looked over the southern wall of Aconcagua. An im­mense distance separated him from the glacier below, the difference between 23,000 and 13,000 feet. Looking down this dizzy precipice, he saw spurs of the mountain flanking the glacier beneath to the right and left, giving it the appearance of a huge amphitheater. The sun was now not far off the horizon, and did not penetrate into this vast pit. Great masses of vapor were mov­ing about in it far below; it looked like some giant cauldron, of which the bottom was quite invisible, two miles vertically below where he stood. But no time was to be lost; it was late, and it was hard to tell, how far the actual summit might be. They turned along the arete to the east, until its rotten condition and its steepness compelled them to leave it. As a cliff in front barred the way and shut out the view ahead, the excitement of the climbers became intense. Vines scram­bled up the cliff. Once level with its edge, all was made clear. Here was the actual summit right before his eyes, and not twenty yards from him was Zurbriggen's stone man, and the ice-axe planted in its center. A few steps more, and they stood on the summit of Aconcagua in silence, the feeling of triumph too great for words. There was no more need to stand and rest. They flung them­selves down by the stone man, crouching close on its leeward side, and Lanti produced the bottle of wine. They neither of them cared for the chilled, sour stuff, and poured it as a libation over the stone man, in order to use the bottle for the record. Turning to the north, the eye traveled over vast fields of ice and snow lying at their feet, down the Val Penitentes and the Val Hermosa, to the giant slopes of Mercedario, forty miles away, and far beyond, over in­numerable peaks and ridges. All around on these three sides was a sight of which the desolate grandeur defied description. But there was beauty as well as grandeur in the view to the west. Beyond the two white western peaks of Aconcagua, to right and left, lay the Pacific. A hundred miles away, the mighty ocean glittered in the evening sun. Far down to the south, and away some fifty leagues to the north, it stretched in a great blue line. The sun lay low on the horizon, 160 miles away, and the whole surface of the ocean between the point of vi­sion and the sun became suffused with a ruddy glow. The shimmering of the light upon the water could be distinctly seen, so that it seemed quite near to them, and it was diffi­cult to believe that the distance was so im­mense. But the setting sun warned them that it was time to descend unless they would be overcome by night at this great altitude. It was nearly half past six, and should clouds obscure the moon, the descent would be very perilous. Nearly an hour and a half had been spent upon the summit, nor had the time seemed long. For to take in all its details and appreciate that vast scene was a hercu­lean task in that short time. They felt no ill effects from the altitude while thus at rest, with the wind whirling great clouds of snow from the arete up into their faces, and the thermometer at seven degrees Fahrenheit. With great reluctance Vines gave the word to pack up and descend. They had looked upon one of the grandest sights ever beheld by man, and would never perhaps look on anything again to equal it. When the summit was left behind, the sun dipped into the Pacific, a great ball of fire, leaving a wonderful after-glow. Then began a series of magnificent changes of color. The whole Pacific Ocean from north to south, together with the sky above, was lit up with a fiery red glow, which changed slowly to purple and then to blue. They were not, however, in darkness; for soon after the sun had set, the moon rose and shone bright­ly, revealing everything with wonderful dis­tinctness in the clear air, while for at least half an hour the wonderful glow remained on the horizon of the Pacific, a great red line of subdued fire high in the air, and dark­ness between. Nothing simpler in theory could be con­ceived than the descent down the great slope to the camp. But for men in such an exhausted condition it was no easy task, and the two hours seemed more like six, as with heavy, weary steps they flounder down the steep snow or broken stones, from time to time attempting to glissade, in their anxiety to reach camp by the quickest means. Too exhausted to support themselves with their axes, and with the snow in bad condition, they had to give this up. Vines had contin­ually to call a halt, in order to gain breath and strength. The way seemed never-end­ing, but the moonlight helping them, their direction was good, and soon they heard the voices of the two Pollingers, whom I had sent out from the camp to meet them and bring them in. Wrapped in all the available clothing, I awaited them at the camp. The thermom­eter had run down to twelve degrees at sun­set, and was still falling. As they came slowly over the snow towards me in the moonlight, I was able to realize by their appearance and gait that their task had been severe. They both looked exhausted, more especially Vines, a desperately pitiable ob­ject, with beard and moustache a mass of ice frozen hard to the helmet. He did not seem to appreciate my greetings or con­gratulations, but crawled into the tent, hardly having the strength to pull his sleep­ing-bag over his shoulders. I had heard so much from the people of Mendoza about the mountain of Tupungato and the difficulties surrounding it that I particularly wished to see it ascended. 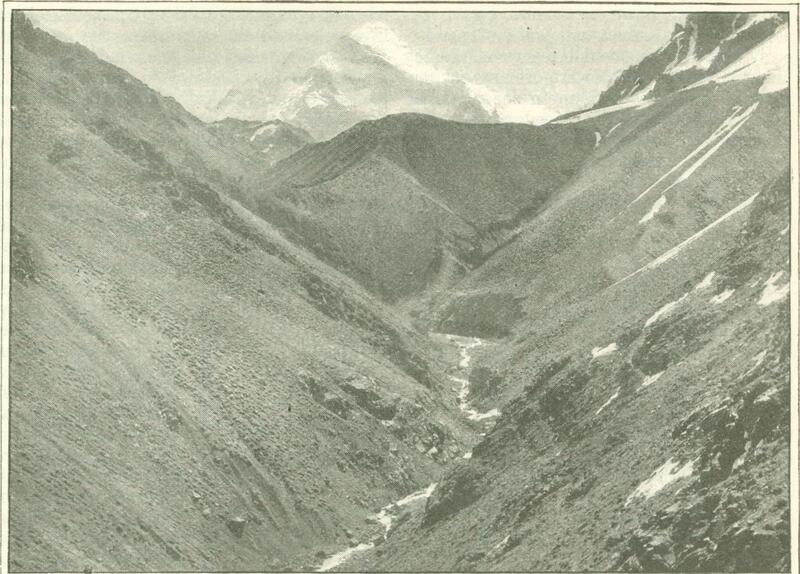 I took, therefore, the first opportunity the weather gave to send Vines to the south to attempt the mountain, while Lightbody and I confined ourselves to the measurements of heights and traverse work in the high val­leys leading to Aconcagua. Tupungato is a mountain nearly 22,000 feet in height, on the great chain which forms the watershed and at the same time the frontier boundary between Argentina and Chile. It is sixty miles to the south of Aconcagua, fifty miles east of Santiago, and 120 miles from the Pacific coast. On the 25th of March, Vines left Punta de las Vacas with Zurbriggen and Lanti and a caravan of four mules, under the charge of an arriero of the name of Fortunato. Af­ter a journey of much difficulty, they came, on the third day, in sight of Tupungato, within ten miles' distance: it had been out of their view almost ever since they started. And now arose the question how near they could approach the mountain with mules. The advantage of attacking a moun­tain of this height from a base camp at a high level cannot be over-estimated; 10,000 feet can be ascended from sea level in a day, but it is a very different matter when one's starting-point is 10,000 feet above the sea. Vines hoped to take his pack animals to 14,­000 feet, bivouac there, and if possible, make the ascent in one day from that height. Great was his disappointment to find that all pasturage ceased below 11,000 feet, and that the valley became impassable for animals be­yond that point. This was a serious diffi­culty, with only one porter to rely on. There was nothing for it but to form the base camp at a distance of over nine miles from the summit. However, on the next day, in spite of the protestations of Fortunato, two mules were forced up to 13,000 feet. Everything that could be dispensed with was left behind. Provisions for three men for four days, with sleeping-bags and covering, a small cooking-stove, and a few instruments, and other necessaries were all that could be taken without overloading. The animals had a very hard time of it, but the work they did was invaluable, and Vines was able to bivouac with Zurbriggen at 14,000 feet. With such limited porterage they had to dispense with a tent. They chose a spot protected on one side by a wall of ice and on the other by a great overhanging boulder, and crawling into their eider-down bags, slept the night in the open. Lanti joined them at daybreak, and a start was made soon after. A three hours' ascent of a formation of ice pinnacles brought them to a great snow field, whence a magnificent view was obtained of Aconcagua sixty miles away to the north. Crossing this, they reached the foot of the great spur that ran north from the dome of Tupungato. At the height of nearly 17,000 feet Lanti turned back. Zurbriggen and Vines continued, and reached the height of 19,000 feet. They had been casting anxious eyes towards the Pacific as they ascended the spur, for storm clouds had been rolling up towards Tupun­gato all morning, and at 3.30 P.M. burst over the dome. They left an account of their at­tempt, and beat a hasty retreat, reaching the base camp in the valley late in the evening. The next day they started for Vacas, now convinced that the stories which reached them from Mendoza of the difficulties to be encountered on Tupungato were no supersti­tious exaggeration. More tents and provi­sions would be required, and, above all, more porters. A few days later, therefore, I sent down what porters I could spare from my work in the Horcones Valley to join Vines at Vacas. Reinforced by Joseph Pollinger and Loehmatter, the party reached the Tu­pungato base camp on the 5th of April, and next day Vines, Zurbriggen, and two por­ters slept again at the 14,000 feet biv­ouac. They started early on the 6th—it was a bitterly cold morning - and reached the top of the great spur at midday. From this time forward everything moved badly with them. No longer sheltered from the north­west, they met the full force of the terrible gale. Rucksacs were taken off and opened, and every available stitch of clothing taken out. But in spite of double helmets and greaves it was impossible to face the wind, which beat them out of their course. Hoping that the weather would clear, they struggled on for two hours through storm and wind, vainly seeking shelter every ten minutes. At last a rock was found which would afford some kind of protection, and it was agreed to wait beneath it in the hope that the wind would clear the clouds. At 2 P.M. it became evident that it would be madness to proceed or even delay. The clouds were roll­ing in all around them, and even far below them. Once more they retreated, and reached the valley exhausted and disheartened late in the evening. The great distance to be traversed, the effects of the altitude, and the shortness of the days made it impossible to ascend the mountain from so low a level as 14,000 feet at this season of the year. So after a few days' rest at the base camp, a bivouac was made, on the 8th of April, at about 17,000 feet, at the foot of the great spur. Vines slept here, with Zurbriggen and Lanti. I will not enter into the details of their sufferings during that night spent on the ice. Suffice it to say that the wind, rising to a hurricane, wrecked the tent, and left them exposed to the mercy of the storm, with the thermometer at five degrees. Half frozen, they retreated to the valley in the morning. It was now so late in the season - April here corresponding to October in Switzer­land - that they deemed it almost impossible to make the ascent. 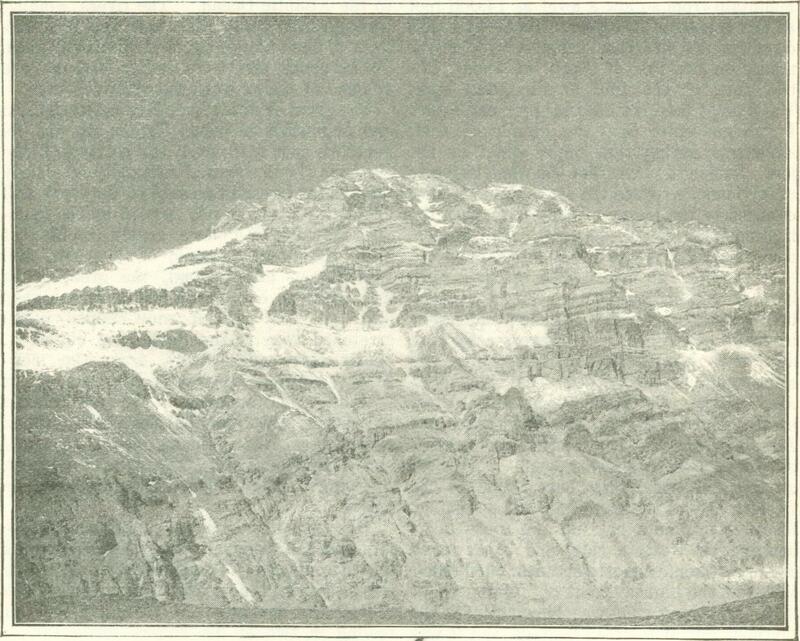 However, after two days' rest they became more sanguine, and slept again at the 17,000 feet bivouac on April 11th. On Monday, the 12th, Vines made a fourth attempt, with Zurbriggen and Joseph Pollinger. The weather was perfect but for a cold northwest wind. 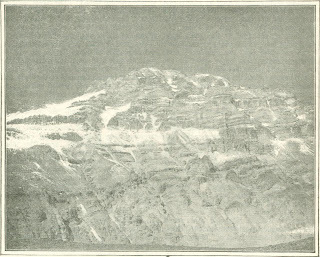 After as­cending the spur, they bore round to the western side of the mountain, and scrambled for an hour and a half up the rocks over­hanging its western side, and after many disappointments and misfortunes found them­selves at the highest point of Tupungato at 3.45. A strong wind was blowing, with the thermometer at thirteen degrees, and it was intensely cold work taking photographs and bearings. On the dome of Tupungato is an undulat­ing plateau covering an immense area, from which three peaks rise up, that to the far north being the highest and attaining to a considerable height above the plateau. The whole of the northwest side of the mountain, the great spur, and the plateau, open to the sun and swept by terrific northwest gales are entirely free from snow in summer, and yet from the north and east the mountain appears robed in white from base to summit. Vines traversed the plateau from north to south, but could discover no sign of any crater. The sky was cloudless and the view superb. About fifteen miles to the north­east, the Cerro del Plato stood up from a mass of high mountains. Turning further from the north, and looking due east, the Cerros became very l0w and almost disap­peared in the low hills sloping down to the pampas or great plains of Argentina, which start, seemingly, from the base of Tupun­gato and stretch almost without interruption to the Atlantic Ocean. The rivers winding through this great plain, and the dim out­lines of the villages could be distinctly seen. To the south, the Cerro de San Jose and the volcano of Maipu were the chief features. The great frontier boundary between Chile and Argentina, of which Tupungato and its northern spur form part, the parting of the rivers to the Pacific and Atlantic, was clearly marked far beyond San Jose to the south and fifty miles to the north, formed by the beau­tiful ice peak of Pollera, nearly 19,000 feet high, the great pyramid of Navarro, 500 feet higher, and, beyond, the great peaks and glaciers of Juncal, 1,000 feet higher still. A vast sea of snow-capped peaks stretched away to the north, and out of it, nearly sixty miles away, arose the mag­nificent mass of Aconcagua, like some great rock alone in its majesty. It was difficult to realize that many of the peaks around were higher than Mount Blanc, so small and insignificant did they appear beneath the giant slopes of the Sovereign of the Andes. The men had been an hour on the sum­mit, and had been so busy that it seethed like five minutes. It was five o'clock, which was so late at that season that an immediate retreat was imperative. Vines had lost all feeling in two of his fingers while taking photographs in that icy wind, and feared a severe case of frost-bite. Zurbriggen seized his hand as they began to descend, and by dint of pinching and rubbing for the first thousand feet of the descent, succeeded in restoring circulation. They reached the 17,000 feet bivouac in the moonlight at 8 o'clock, and could go no farther - so went supperless to bed. Two days later, Vines and Zurbriggen de­termined to start early and, if possible, reach Vacas before sunset. They chose the best of the animals, and started before daybreak on the 14th of April, relying on their horses in the darkness to find the way for the first hour, and without drawing rein for fourteen hours, except to water their horses at noon, they reached Vacas the same day - nearly fifty miles over rough and dangerous country. Originally published in McClure’s Magazine in November of 1898.